The Gateway Pundit layed a trap to catch Twitter unlawfully suppressing conservative news. Earlier today this story was reported on TGP, it should have broke the Internet. In fact Democrats, Liberals and Commies should have been the biggest retweeter of this story. A report at The Specator on Friday claims dirty cop Robert Mueller met with Attorney General Bob Barr and the two agreed that President Trump’s children should be indicted. The report goes on to say that Special Counsel Robert Mueller and his 13 angry Democrats also want President Trump to be indicted but that Barr pushed back on this. 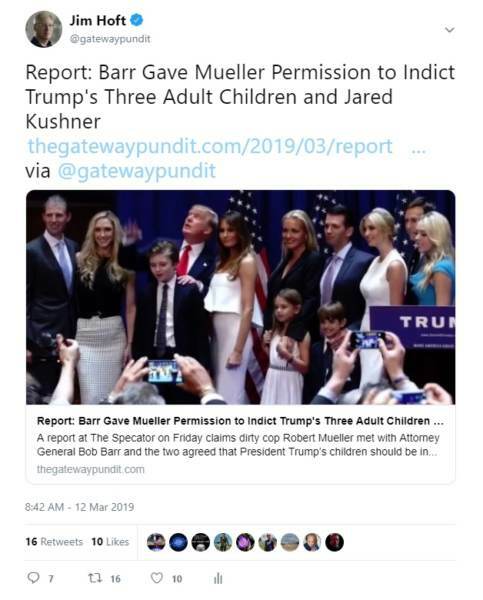 Of course it barely got 10 impressions so Gateway Pundit then posted this follow up. Facebook has eliminated content from the vast majority of top conservative publishers since 2017. And it’s not just Facebook. Recently activity on the Gateway Pundit Twitter account suddenly flatlined. Tweets that would normally get hundreds and thousands of retweets and likes are suddenly hidden from public view with only a couple dozen retweets. Of course if there were any Merit to this story the NYT, WaPo and those usual Leak pipes would have been all over this story. When you read it from the Spectator is sounds like more wishful thinking for the TDS never Trumpers and pure fantasy speculation.